Medical Records Scanning services help Practices, Hospitals, and Clinics add paper-based Patient Charts to Electronic Medical Record (EMR) and Electronic Health Record (EHR) Systems. As an increasing number of Healthcare Organizations implement EMR and EHR Systems, the importance of Medical Records Scanning is growing exponentially. Many Practices and Clinics are confronted with the reality that scanning all of the legacy patient chart information is often a bigger challenge than initially expected. Shoreline Records Management offers the experience and expertise to simplify this process. Our team of professionals can help with every step of the process. What is Shoreline's process for Medical Record Conversion? Our team of professionals will work with your staff to coordinate the boxing, preparation and transportation of your important Medical Records to our Production Document Scanning Facility. We take great care in making sure you continue to have access to your patient information throughout the process by barcoding every chart and every box as it is sent out for scanning. Once Patient Charts are received at our Facility, our team will carefully inventory your information and provide a detailed tracking manifest of all of the information that we've received. This enables us to quickly and easily access a patient chart if it's needed during the Medical Record Scanning process. Preparing Medical Records for Scanning is often the most time-consuming, tedious part of the process. Our experts will remove all staples and fasteners, repair any ripped or torn pages, and carefully sort out the different sections of a Patient Chart, ensuring that you can access the information you need, when you need it. Our production document scanning service center is equipped with leading-edge equipment from Kodak and Canon, featuring Kofax VRS Technology, and we're able to capture all types of detailed information, from Progress Notes to Diagnostic Imaging Results. When scanning Medical Records, and specifically Patient Charts, Quality Control is essential. That's why we review every image to ensure readability and quality. Each image is carefully analyzed to ensure that nothing is missed during the scanning process. We'll work with your EMR or EHR vendor to ensure that we can capture and tag your Charts with all of the pertinent information so that you can access the scanned images through your software. We can index your files based on Date of Birth, Patient ID Number, First and Last Name, and any other information that you need to help you access your files when you need them. Shoreline will handle the integration points and ensure that your imaged data will be delivered to your EMR or EHR System efficiently. We eliminate the headaches normally associated with importing information by partnering with many leading vendors to feed their systems at the database level. Oftentimes, a Practice, Hospital, or Clinic will want to preserve the physical paper for peace of mind. Shoreline offers secure, climate-controlled Medical Record Storage to archive your information for as long as it's needed. In addition, we offer Certified Document Destruction to ensure that your information is properly discarded when the time comes. Once you've decided to start your Medical Record Scanning project, it's important to get an idea of how many total Patient Charts you will be looking to have scanned. We provide our pricing in terms of Price per page, which includes all of the services relating to Medical Document Scanning. For most projects, our services can range between $.05 and $.15 per Image based on the total Volume of pages to be scanned, the amount of preparation required, and the number of index fields requested. Therefore, every project is quoted on a case-by-case basis. If you're interested in getting a proposal for your Medical Record Conversion project, contact us by filling out the short form on this page or calling our solutions consultants at 1-800-435-2956. Are you looking for Medical Records Scanning services? Contact us to discuss your project. 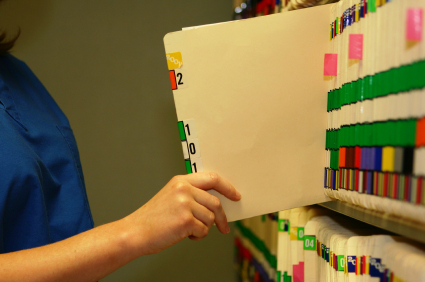 For some Practices, the need to access historical records is minimal, and in those instances, we offer a Hybrid Solution, where we’ll store all of your Medical Records in hard copy, paper form at our Facility, and Scan only the charts that you request. This option can help to save some of the costs associated with implementation, while still providing a truly digital working environment. To find out more about how Shoreline can help your facility to convert your Patient Medical Records to digital documents, contact us by filling out this brief form or by calling us at 1-800-435-2956.